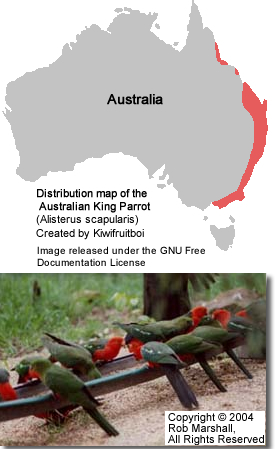 The Australian King Parrot Alisterus scapularis are endemic to the eastern coast of Australia. They range from North and Central Queensland to Southern Victoria in Australia. They favor the humid and heavily forested upland regions of the eastern portion of the continent, including eucalyptus wooded areas in and directly adjacent to subtropical and temperate rainforest. 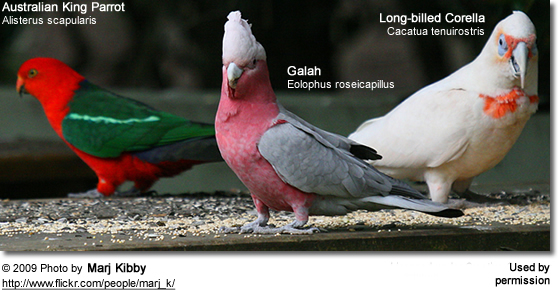 They are frequently seen in small groups with various species of Rosella. 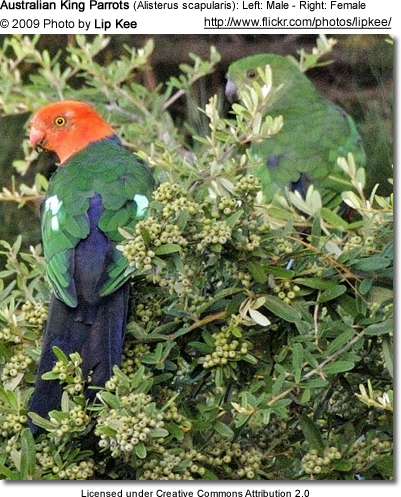 Further from their normal eastern upland habitat, they are also found in Canberra (Australia's national capital) during winter, outer western suburbs of Sydney, and the Carnarvon Gorge in Central Queensland. In their native Australia, they are occasionally bred in aviaries and kept as calm and relatively quiet household pets if hand-raised. However, they are relatively unknown outside Australia. As pets, they have limited talking ability and normally prefer not to be handled, but they do bond readily to people and can be very devoted pets. Life expectancy in the wild is unknown, but some pets have been known to live up to 25 years. 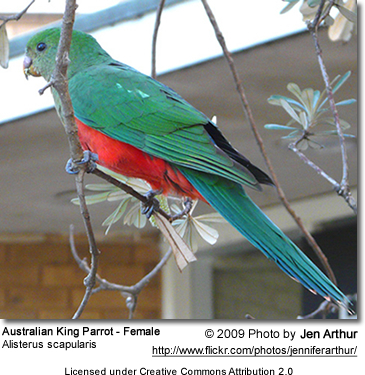 However, some King Parrots are known to develop lung diseases as a result of living indoors as household pets. Adults of both sexes are very majestic birds, typically averaging 42 - 43 cm (16 - 17.2 inches) in length, including their long tail. 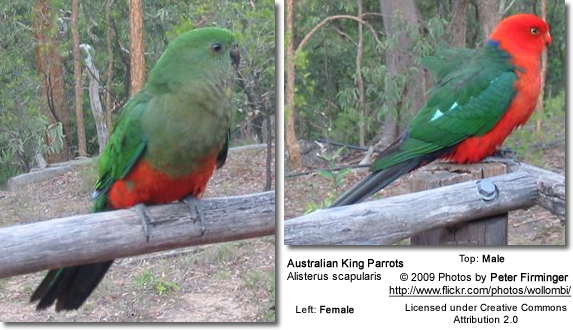 The adult (>4 years) males are very striking in appearance with a red head, breast, and lower undersides, with a blue lower back, and green wings and tail. They have a reddish-orange upper beak with a black tip and a black lower beak, and yellow eye ring. 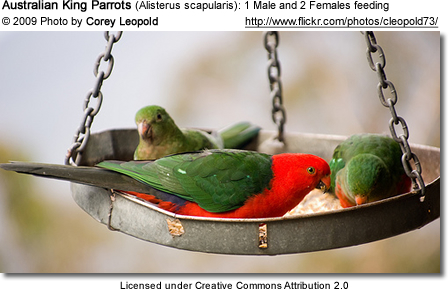 These parrots are sexually dimorphic. 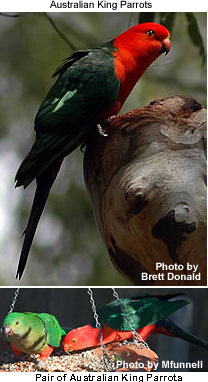 Females are similar in appearance except for a green head and breast, a black upper beak, and paler yellow eye ring. Please refer to the below photos. Juveniles of both sexes resemble the females. There is one subspecies, A.s. minor, which is found at the northern limit of its range, and is typically about 5 cm (2 inches) shorter than the nominate species but otherwise is similar in appearance. Several exciting mutations have occurred in aviculture -- please refer to the photo to the right. 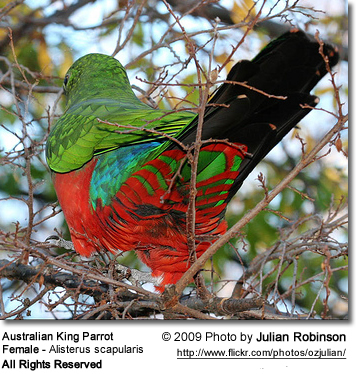 King Parrots are desirable aviary birds because of their strikingly beautiful plumage and their quiet / calm disposition. In most areas, they are not readily available. The average clutch size consist of 3 - 6 eggs, which are incubated for about 20. "My King (called Skipper) was hand reared and talks beautifully even using the same intonation as I use. He is guaranteed to copy a phrase or word I repeat very slowly to him backing it up with it being repeated on a tape to him. He copies laughter too. We were advised to avoid whistling to him at the beginning as he needed to use our language. He has his calling voice when he wants attention. He also naturally copies sound the microwave makes etc. He must listen carefully as when he hears certain words he starts on the associated repertoire. He watches us carefully. You are so right about the need for a stimulating environment. His cage is large with colourful toys. You are right about the bonding to one person, as I am the only family member, whom he will allow to take him out of his cage and to whom he talks. Once out , he will go from one person to another. His cage is the size of a big Macaws cage, as he needs to feel a certain freedom. He had to learn to fly ,as he would have had to in the wild. He comes out frequently. He has never pecked me. However if I was not appropriate and hasty or did not approach him slowly he might I guess as he relies on the trust established . He is beautiful to look at and most engaging as he watches everything that goes on and if we go away for a weekend we leave the tv or music on .ON our return he starts on one of his repertoires. ,nodding his head up and down with his eyes flashing bright yellow with excitement . Perhaps his companionability is one of his attractions. King Parrots are not only incredibly beautiful, but also quiet (other than the occasional shrill sentinel call) and gentle in nature. They are quite different from other parrot species that tend to be noisier, more destructive and more aggressive than they tend to be. They are not known to be cuddly birds, but these gentle creatures do become very confiding and have a knack for entertaining themselves. 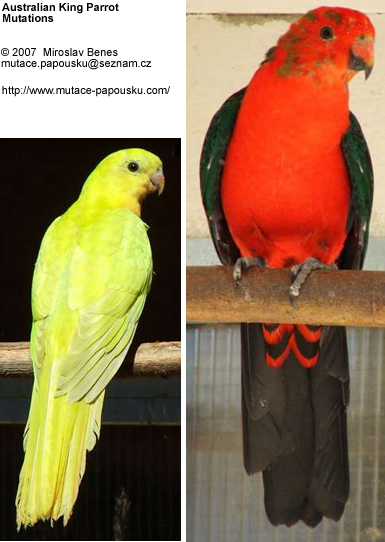 Because they are so quiet and colorful they are very much in demand as aviary birds. 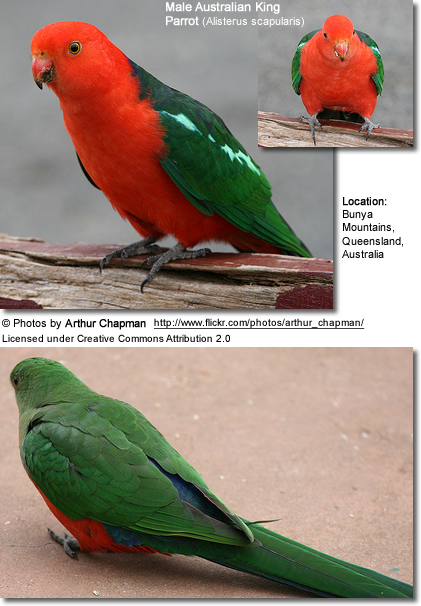 King Parrots are social birds and do require daily interaction with their flock -- be it with other birds in an aviary setting or with their human family. In an aviary setting, they do well even when kept with smaller birds. 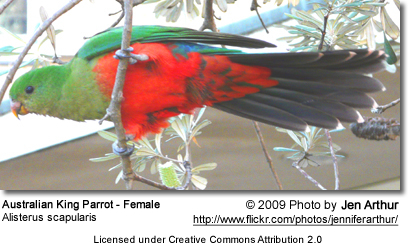 It is important to remember that these parrots require space to accommodate their activities and their long tails. The width is considered more important in the long-tailed species rather than height in a cage -- but remember, the biggest cage possible is always the best choice. However, they are best kept in a planted aviary that allows them plenty of room to fly from perch to perch. 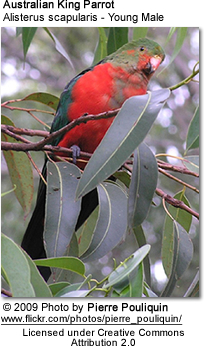 King Parrots are quieter and less destructive than other parrot species. The challenges that you might experience with them maybe poor socialization - in which case patience and time in taming and gaining the trust of the parrot is necessary. Even a young bird that has not been neglected and abused requires proper guidance; this becomes even more challenging when it involves a rescued bird that may require rehabilitation. If they feel cornered, some biting may occur. They have some mimicking ability and most of them learn to talk, and their voices are soft and sweet to listen to - similar to the voice of an eclectus parrot. AvianWeb Resources: I put together web resources for you to help you understand your pet bird and properly direct him. Please visit the following website to learn more about parrot behavior and training. 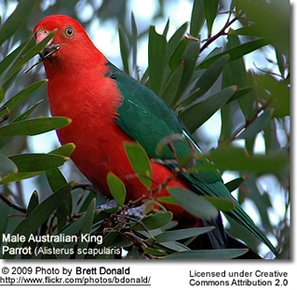 The King Parrot hen usually lays 3 to 6 eggs in each clutch, which she incubates for about 20 days.